Dutch budget re-issue label Brilliant Classics has released a double CD of Russian Orthodox liturgies and folksongs sung by the famous Don Cossack Choir and Jaroff Women's Choir conducted by their founder Serge Jaroff, and it is available in the UK for less than £6. As David Cavlovic reminded us in a recent comment, the Don Cossack Choir, seen above, sung on Herbert von Karajan's 1967 recording of the choral version of Tchikovsky's 1812 Overture. 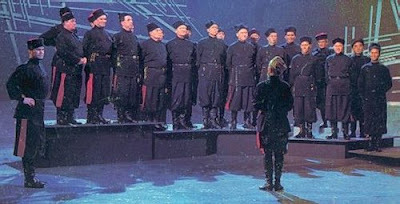 This remarkable choir was formed by exiled Cossacks in a Turkish internment camp in 1921 under the direction of Serge Jaroff, who had been a lieutenant in the army of Tsar Nicholas II. As their fame increased the choir were based in Bulgaria, France, Austria and then America, where they were managed by the impresario Sol Hurok. Serge Jaroff conducted the choir for sixty years, became an American citizen and died in New Jersey in 1985. Below is a a YouTube video of the Don Cossack Choir directed by Serge Jaroff singing in Germany in the 1930s. More Brilliant Russian sacred choral music here. I would think the original requirement of having fled the Bolshevik Revolution in order to join the choir no longer applies. The Canadian actor Arthur Hill recounted a story of growing up in the Prairies of Alberta and Saskatchewan in the 1930’s. The Don Cossack Choir was scheduled to perform in his town, which was a bit of a hike through the wheat fields from the train tracks. He recalls, as a boy playing in the fields, seeing the choir members approaching, all of them in tears. He asked one of them why they were crying. The member replied the land reminded them so much of the Steppes back home, and of course, they will be singing for Ukrainians and Russians. They were homesick. The initial recordings of the Don Cossacks were originally for Columbia Records. When they switched to American Decca, the reciprocal agreement of leasing with DGG kicked in and so that’s how they appeared in the European market (same with Joel Greenberg’s early music ensemble). It seems they became bone fide Polydor/DGG artists in the mid-60’s. I meant Noah Greenberg, not Joel Greenberg.